Our 15-minute PTPA video has been the #1 most viewed video on YouTube (over 12 million views) regarding potty training a puppy. We thought you may be interested in seeing comments and questions from real YouTube viewers about the Puppy Apartment. If you visit YouTube.com and view our video titled Potty Training Puppy Apartment – Official Full Video, you will see all the comments and questions. For your convenience, we have posted a small sample of them below. We have included their YouTube username under their question or comment. Their question or comment is in blue, and if they asked a question, our response is in black. Is there a size big enough for a full grown Labrador? He's not fully grown yet, but he grew twice the size he was in 2 weeks. I dont want to have to constantly buy different sizes. We are currently doing the crate training but i just think its cruel. He also has amazingly long legs, which i guess im just not used to because we also have two dachshunds. Theyre already trained, but my Lab is having a lot of accidents. We would suggest an XLarge PTPA for a Labrador Retriever. The XLarge PTPA will last your dog’s entire life because the bedroom is adjustable. The PTPA will now provide your dog a safe, warm and comfortable place to relieve himself without having to painfully hold it or pottying on his bed. It will also take away all the stress of worrying about your dog having to potty. Just follow our simple training tips in our free Instructional DVD that comes with the PTPA and those accidents will disappear. what size would you suggest for a yorkie? A Yorkshire Terrier (aka Yorkie) can use either an XSmall or Small PTPA. If you are confident that your puppy will not grow to be over 5lbs as an adult we would suggest an XSmall PTPA. If you think there is a possibility your puppy will weigh over 5lbs as an adult then we would suggest a Small PTPA. If you are not sure about the adult weight, then the safe way to go is the Small PTPA. The PTPA can never be too big, however, it can be too small if you order the incorrect size. Great video, does the apartment come in size small, medium, large and x large? Thanks. Yes, the PTPA comes in all those sizes and more. Is there one for a size such as a German Shepherd? Yes. We would suggest an XLarge PTPA for a German Shepherd. What size do u suggest for a Shetland Sheepdog puppy. A Shetland Sheepdog (aka Sheltie) normally ends up weighing about 20lbs as an adult. We would suggest the Large PTPA for your Sheltie. The PTPA can never be too big, however, it can be too small if you order the incorrect size. Some dogs ends up weighing over the average adult weight and you want your PTPA to last your dog’s entire life. can big dogs like, let's say, laboradors, fit in one? When they are full size? Absolutely. We would suggest an XLarge PTPA for a Labrador Retriever. what size do you recommend for a Pomeranian? We would suggest a Small PTPA for a Pomeranian as they usually end up weighing around 7lbs as an adult. what size do you suggest for a lhasa apso? We would suggest a Medium PTPA for a Lhasa Apso as they usually end up weighing about 13-15lbs as an adult. this looks amazing!!!! what size do you think would fit a Norwich terrier? thanks!!! We would suggest a Medium PTPA for a Norwich Terrier as they usually end up weighing about 12lbs as an adult. what size would a pomeranian get? We would suggest a Small PTPA for a Pomeranian as they usually end up weighing about 7lbs as an adult. I'm definitely going to try that! thanks! Hello PTPA, I'm getting a Miniature Pinscher for my Birthday! I have been searching up a bunch a supplies for the new comer. I'm interested in buying this! Its just so amazing! But what I want to know is what size should i get for a 1-6 Month old puppy & a 7-12 month puppy? If you think either one of your Miniature Pinschers will weigh over 10lbs as an adult, we would suggest a Medium PTPA. If you think they will weigh less than 10lbs as an adult, we would suggest a Small PTPA. If you are not sure then go with the Medium PTPA. The PTPA can never be too big, however, it can be too small if you order the incorrect size. What size should I get for a Chiweenie about 1 year old? We would suggest a Medium PTPA for a 1yr old Chiweenie. hello i also have a toy poodle its not a toy what size do think is good for it? We would suggest a Small PTPA for a Toy Poodle. do yall make anything bigger for say an american staffordshire? Yes, we would suggest an XLarge PTPA for an American Staffordshire Terrier as they usually end up weighing about 60lbs as an adult. This is great! :D I have a 6 year old standard American Eskimo dog and she has trouble holding it when everyone's out of the house and then she has to go to the bathroom when she can't wait anymore. She would sometimes miss the underpad we set out for her. What would be a good size for my dog? It depends on what size American Eskimo Dog you have. If you have a Toy, we would suggest a Small PTPA. If you have a Miniature, we would suggest a Medium PTPA. If you have Standard, we would suggest a Large PTPA. Hi, this looks great! I will be getting an 8 week old corgi in the next month and will use this for a permanent bathroom in my apartment, what size should i get to accommodate her through puppy and adult years? she will be no more than 30 pounds full grown! Thanks. We would suggest a Large PTPA for your Corgi. We would suggest a Large PTPA for your Shiba Inu. I think this is a wonderful product that would be really useful whenever I get my pup. I am thinking of getting a Cavalier King Charles spaniel next year, and I want to know what size I would need to get. Cavaliers normaly grow up to around 14 inches tall at the most, so what size do you think I would need? We would suggest a Medium PTPA for a Cavalier King Charles Spaniel as they usually end up weighing about 13-18lbs as an adult. Hey I'm getting a Yellow Labrador Retriever Puppy and I wanted to know what PTPA size would be good for him? We would suggest an XLarge PTPA for your Yellow Labrador Retriever. Is it ok if I put 3 teacup yorkies in a medium ptpa? Only if all three Yorkies like sleeping together. If any of your Yorkies prefer to sleep alone then we would suggest they have their own PTPA. There is also another up side to this crate. It is great for elderly people that have a dog. i have a pomeraniain what size would be ok? I'm just wondering, I'm getting a beagle puppy and what size cage should I get? We would suggest a Large PTPA for a Beagle as they can weigh up to 30lbs as an adult. does this mean i dont have to take my dog out every night to let it use the bathroom? Yes, you and your dog no longer have to go outside in the freezing cold at night and wait countless minutes for your dog to hopefully go potty. The PTPA will be a safe and warm place for your dog to go potty at night. hey, is shipping available to Canada? i wanna buy this for my yorkie! Yes, we ship to Canada everyday. We look forward to potty training your Yorkie! What size for a Toy fox Terrier? Small? Yes, a Small Puppy Apartment would be best for a Toy Fox Terrier. I absolutely LOVE my Puppy Apartment! It was definitely what I needed for my new puppy a couple months back, she is now trained! Thanks again!! It’s always our pleasure to potty train puppies and to re-train adult dogs to use the PTPA. Thanks for sharing your experience with the PTPA! hi, I have a 4 year old pug and I was wondering what size would be right for him? Hes about 25 pound's so would a large be ok? Yes, a Large PTPA would be best for a 25lb Pug. Thanks for your kind words. We would suggest a Medium PTPA for your English Toy Spaniel as they can reach up to 14lbs as an adult. Hey, great looking product and video! Curious, I have an Australian Shepard/Golden Labrador mix. He's 7 weeks old and insists he's part of our pack (me n' the wife). We live in an apartment and my dog loves to poop and pee on my balcony while we're both at work. We tried the grass and that was a massive FAIL. We're thinking this is a great solution. What type of surface is below the pee-pad in the apartment? We're gone for 10 hours and our dog eats/drinks A'LOT during this time. The surface below the dog’s bed and potty pad is very strong, durable and thick composite plastic pan. The pan can be locked in place or unlocked if you ever need access to it. The PTPA and its components are made of the highest quality materials and craftsmanship. The PTPA was built to last your dog’s entire life. What is the difference between small potty pads and bulk small potty pads? The only difference is the quantity. Small potty pads can be purchased individually. A bulk pack of small potty pads have 150 pads in a box and you receive a bigger discount for buying the potty pads in bulk. hi, im planning to get a sheltie soon. would a medium size be okay? or a large? A Shetland Sheepdog (aka Sheltie) normally ends up weighing about 20lbs as an adult. We would suggest the Large PTPA for your Sheltie. The PTPA can never be too big, however, it can be too small if you order the incorrect size. Some dogs end up weighing over the average adult weight and you want your PTPA to last your dog’s entire life. Wondering what size for a Shih Tzu? We have a full grown that is 10.8 lbs and a 9 week old that is maybe 1.5 lb at most. Will use on the puppy and then when it is trained will RE-train the adult. We would suggest one Medium Puppy Apartment for your situation. After you potty train your Shih Tzu puppy, you can then re-train your adult Shih Tzu. This way you do not have to buy two Puppy Apartments. I have a one year old Pomeranian, a small one would be right for him right? Yes. A Small PTPA would be best as long as he is under 10lbs. What size do you recommend for a maltese (right now, it is only 3 months)? We would suggest a Small Puppy Apartment for your Maltese since they usually end up weighing about 4-7lbs as an adult. What size would you suggest for an italian greyhound? A Medium PTPA would be best for an Italian Greyhound as they usually end up weighing about 10-14lbs as an adult. What size ptpa for a standard beagle? We would suggest a Large PTPA for a Beagle because they can weigh up to 30lbs as an adult. Thanks for your inquiry. This is a great idea! Really smart. And no wonder people have trouble potty training their dogs. I'd never be able to get a dog to go on the toilet. Haha. Sorry, had to make that joke. Anyway this is a really great product and once I adopt my puppy I'll certainly look into getting one. wow this is amazing n very awsome lol who ever created this puppy potty training device lol there awsome lol. lol mm im just wondering though how much $ is the device?? Thanks for your kind words. We have pricing information on our web site and the price depends on the size of the PTPA. Where would you buy one????? The PTPA is only available on our website and should be in pet stores next year. Is the PTPA that Ace is in a Medium or a Small? Ace was using a Small PTPA. Near the end of the video we have 3 dogs using PTPA's and the PTPA in the middle is a Small and the two on the outside are Mediums. Great idea! How long does it take to arrive once I place my order? Also, does it take an older dog (say, 2yrs old) to figure out where to go potty? It normally takes 3-5 business days depending on what state you live in. Older dogs easily learn where to go potty with the PTPA. Our 39-minute Instructional DVD that is free with the PTPA discusses in detail how adult dogs easily adapt to the PTPA. Great info for Dachshund owners! Chihuahuas are normally in our Small PTPA. If you think your Chihuahua will be over 10lbs as an adult, then the Medium PTPA would be best. if i have a bichon frise and coton de tulear mix would it be a medium or a large? because i have a puppy now but im not sure how big she'll get. A Medium Puppy Apartment would be best for that breed mix. What size crate should i get for a European Doberman Pinscher? Also this is the best idea for dog owners all around. We would suggest an XLarge PTPA for a European Doberman as long us your Doberman is still a puppy. Please visit our web site for more details. Thanks for your inquiry. When a dog is fully grown will it still be big enough? Yes. The PTPA will last for your dog’s entire life. It will take away all the stress of having to worry about your dog having to potty. Our system also teaches your dog that they only have one area in your home that they are allowed to potty, which is in the bathroom section of their PTPA. Just make sure you look at our PTPA Sizes chart on our web site before you order so you get the correct size for your dog. This is absolutely brilliant! I cannot believe this idea has not been created until recently. I truly wish you the best of luck with this product and hope to see it in pet stores all across the USA and Canada (and the rest of the world)! I most definitely will be purchasing this in the near future when I get my puppy! Thank you for the kind words. We look forward to potty training your new puppy in the near future. does this work with bigger dogs like german shepherds? Absolutely. German Shepherds are one of the most popular breeds currently using the Puppy Apartment. I LOVE this idea. It really seems like it will work. Umm, what size is best for a labradoodle? Thanks, BTW the room divider seems GENUIS! Thanks for the kind words. Yes, the PTPA works extremely well and has successfully potty-trained puppies/dogs all over the world. Labradoodles can vary in weight. Standards normally range between 45-80lbs and Miniatures range between 25-45lbs. Please click on the PTPA Sizes link on our web site to help make the correct size decision based on your particular Labradoodle. what size should i take for a Bichon Frise? We would suggest a Medium PTPA. A Bichon Frise normally ends up weighing between 10-16lbs as an adult. Thanks for your inquiry. do you have one for Labradors??? Yes. We would suggest an XLarge Puppy Apartment for a Labrador Retriever. Thanks for your inquiry. What is the size of the cage that Ace was using in the video? because I'm planning to get one for my Maltese and Ace looks like a pretty small dog compared to mine. Ace was using a Small PTPA in the video that we have on our web site and on YouTube. Ace was approximately 5lbs during most of the video and has since grown to his final adult weight of 8lbs and he continues to use his Small PTPA as an indoor doggie bathroom. As long as you estimate your Maltese weighing under 10lbs as an adult, the Small PTPA should be fine. If you are unsure about the adult weight of your Maltese, a Medium PTPA will also work just fine. Where can I get this product???? You can get the Puppy Apartment on our web site. You can order online or over the phone. Please visit our web site for more details and pricing information. What size should i get for a Pomapoo? A Pomapoo is normally in our Small PTPA. If you think your Pomapoo will weigh over 10lbs as an adult we would suggest the Medium PTPA. Thanks for your inquiry. However, I have two chihuahuas that will NEVER sleep separated, so I have to get one that will fit them both, and I want one that will work for their adult sizes as well. What size would you recommend? If you think their combined adult weight will be less than 20lbs, then the Medium PTPA will be fine. If you are not sure on their projected adult weight, we would suggest a Large PTPA to be on the safe side. i need one for my dog!! what size should I purchase for a shih tzu? A Shih Tzu usually weighs between 9-16lbs as an adult. A Medium Puppy Apartment is the way to go for a Shih Tzu. The Puppy Apartment can never be too big, however, it can be too small if you order the incorrect size. Thanks for your inquiry. what is a good size for a Bichon Frise puppy? im goin 2 order one soon, which one should i go with if im getting a Yorkie??? What is a good size for a yorkshire Terrier? Do these work for larger breeds like Golden Retrievers? Absolutely. We would suggest an XLarge Puppy Apartment for a Golden Retriever as they usually end up weighing around 65-70lbs as an adult. Thanks for your inquiry. this is a great idea !.! Hi, this actually looks really good! what size should I get for a miniature french poodle?? We would suggest a Medium Puppy Apartment for your Miniature Poodle as they usually end up weighing between 12-18lbs as an adult. I am thinking about getting my dog one of these. What size should I get for an American Cocker Spaniel?? We would suggest a Large PTPA for an American Cocker Spaniel as they can get up to 30lbs as an adult. What for a cairn terrier? Sorry for the repeating questions, my family is thinking about dog breeds. We would suggest a Medium PTPA for a Cairn Terrier as they usually end up weighing around 13-14lbs as an adult. Please let us know if you have any other questions. We are here to help. how about a size for a pomeranian? Pomeranians usually weigh between 3-7lbs as an adult. We would suggest the Small PTPA for a Pomeranian. Thanks for your inquiry. what size for a teacup yorkie? An XSmall PTPA should be fine as long as you estimate your teacup weighing under 5lbs as an adult. If you are not sure on the weight, we would suggest a Small PTPA to be on safe side. I don't have a dog anymore but still this is a great idea and if I ever get another dog, I will surely get this! it is amazing! I love the idea of this puppy apartment! I was wondering what size I should get for my new Shiba Inu puppy? Thanks! A Shiba Inu can range from 17-23lbs as an adult. We would suggest a Large PTPA for your new puppy. Thank you very much for sharing your experience with the PTPA! what size for a jack russell ?? this looks awesome!!! Thanks! We would suggest a Medium PTPA for your Jack Russell as they usually end up weighing around 14-18lbs as an adult. Oh my gosh, this is an incredible idea! I can't believe this isn't the typical universally used crate yet. When this catches on, it'll be huge. you should try to get in touch with animal planet for recognition... I think you could either make millions off of this or sell the idea for millions. We appreciate your optimism for the Puppy Apartment. We plan on working with Animal Planet and having the PTPA in pet stores nationwide next year. We believe this will be the universally used potty training device and indoor doggie bathroom of the future. The PTPA is patent pending and we spent years testing it and successfully applied for our patent on the device and system. Our goal is to provide dog owners a better and more humane way to potty train their puppy/dog. What size Puppy Apartment should I get for a beagle? We would suggest a Large Puppy Apartment for a Beagle. A Beagle can end up weighing as much as 30lbs as an adult. Thanks for your inquiry. I will be getting an Ibizan hound puppy and do not know which size to get. It's a large dog and i want to make sure he doesn't grow out of it too quickly, but then again i don't want to get a crate that is too large and wont work! We would suggest an XLarge Puppy Apartment for your new puppy. A male Ibizan Hound normally ends up weighing about 50lbs as an adult. The Puppy Apartment can never too big, however, it can be too small if you order the incorrect size. We look forward to potty training your new puppy. What size is good for a Pembroke Welsh Corgi? A Pembroke Welsh Corgi normally ends up weighing around 25-27lbs. We would suggest a Large Puppy Apartment in this case. Thanks for your inquiry. where can i buy the puppy apartment? You can purchase the Puppy Apartment on our web site. The Puppy Apartment is not sold in stores and is only available on our web site. Next year the Puppy Apartment will be in stores nationwide. Can you use this for an adult dog that has been trained to go outside? I'm asking cause, I'm moving into an apartment in the fall and I don't want to have to lock up my dog for hours and make him hold it while I'm in class. Yes. The PTPA was originally invented and designed for puppies, however, adult dogs around the United States and Canada have easily adapted to this amazing potty training device and system. Just follow our simple tips and techniques in our Instructional Video and your adult dog will be able to make a smooth transition. Your dog will still be able to go outside and will have the PTPA as an indoor doggie bathroom while you are at school. Thanks for your inquiry. What about a Bichon Frise? What size crate would be good for them? I think the medium would work, but i'm not sure. We might be getting a puppy soon. This seems so perfect for us. I'd love to see more testimonials though. A Medium PTPA is best for a Bichon Frise. If you would like to see more testimonials from PTPA customers, please click on the Puppy of the Month link or Testimonials link on our web site. Hi, what size do you suggest for a miniature dachshund? A Miniature Dachshund can vary in weight. They can get up to 12lbs as an adult and also have a long body, which will require a slightly larger bathroom. You could get a Small PTPA, however, to be on the safe side we would suggest a Medium PTPA. good vid what size for a border collies......thanks! Border Collies normally range from 30-45lbs as an adult. If you think your Border Collie will be less than 40lbs as an adult, then we would suggest a Large PTPA. If you estimate more than 40lbs then we suggest an XLarge PTPA. If you are unsure, then it would be best to get the XLarge PTPA. The PTPA can never be too big for your dog; however, it can be too small if you order the incorrect size. Thanks for your inquiry. Great video!! What size would you suggest for a Jack-a-bee? Thanks! A Jack-a-bee can vary in size, however, if you think your dog will be less than 20lbs as an adult, we would suggest a Medium. If you think your dog will be over 20lbs as an adult, we would suggest a Large. If you are not sure, then go with the Large to be safe. The Puppy Apartment can never be too big, however, it can be too small if you order the incorrect size. Thank you for the kind words. We are happy that we can help keep your dog with you. Great video i just got a new puppy so this is perfect. What size do you recommend for a beagle? Thanks, we are glad you enjoyed the video. We would suggest a Large Puppy Apartment for your Beagle. What size for a Bichon Frise? A Bichon Frise normally ends up weighing between 10-16lbs as an adult. We would suggest a Medium Puppy Apartment for a Bichon Frise. Hi there PottyTrainingAPuppy. What size would you suggest if we have a Chow Chow? And where can we buy those pads and the cushion where the dog sleeps? We would suggest an XLarge Puppy Apartment for a Chow Chow. You can buy the potty pads and bed on our web site. Thanks for your inquiry. i am going to get two pug puppies soon but i can't decide which size to get, a medium or a large. i read that they can be between 17-24 lbs, so i'm not sure which one to get since the medium is 11-20 lbs and the large is 21-40 lbs. which one would be better for them? If you are unsure which size is best, we strongly recommend ordering the next size up based on your estimate of how much your puppy will weigh as an adult. In this case, the Large PTPA would be the safe way to go. This way you can be sure the PTPA will last for the lifetime of your dog and they will never outgrow it. The PTPA can never be too big for your dog; however, it can be too small if you order the incorrect size. A Yorkshire Terrier (aka Yorkie) is the most popular breed currently using the Puppy Apartment (PTPA). 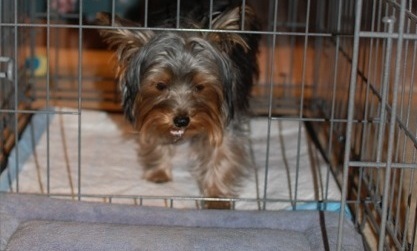 Yes, the PTPA can housebreak any breed of dog, even the Yorkshire Terrier. The dogs in our video are also considered a difficult breed to potty train; however, they adapted quickly to their PTPA and were easily potty trained. We would suggest a Small PTPA for your puppy, unless you know for sure he will be less than 5 lbs as an adult, and in this case an XSmall PTPA will be fine. Thank you so much for the kind words. Yes, you do have the option of having all four puppies in one Puppy Apartment. It is very smart of you to have them potty trained ahead of time. It will save the new owners a lot of time and make your puppies even more desirable. Thanks for spreading the word! We currently ship to customers in the United States and Canada. We can ship to India, however, we suggest viewing our Shipping Policy on our web site for more details. so when it gets older can i still use it as both? or just a bathroom? Yes. You can use it as both or just as a bathroom, the choice is yours. You have so many options of how you want to use it, which is one of the many great things about the Puppy Apartment. As your puppy grows into adulthood, you simply move the Room Divider to enlarge the bedroom. This allows you to only have to purchase one Puppy Apartment as it will last for the lifetime of your dog. what size for a lab/pit? That breed combination can vary in size. We would suggest an XLarge Puppy Apartment. The PTPA can never be too big, however, it can be too small if you order the incorrect size. whats a good size for a female shiba inu? shes currently 13 weeks and about 11pounds so im thinking a small but im worried she will outgrow it fast? so should i get a medium? A female Shiba Inu normally weighs about 17 pounds as an adult. The Medium Puppy Apartment is the right size. Absolutely. After a dog/puppy has been potty trained by the Puppy Apartment, most dog owners will use the Puppy Apartment as a permanent indoor doggie bathroom. Some dog owners will choose to make it an alternative indoor doggie bathroom for situations in which they are not able to let their dog out, such as bad weather, going out for the evening, etc. We would suggest a Medium Puppy Apartment for a Norwich Terrier as they usually end up weighing about 12lbs as an adult. A Pembroke Welsh Corgi normally ends up weighing around 25-27lbs. We would suggest a Large Puppy Apartment in this case. Let us know when you are ready. Thanks for your inquiry. What size for a portuguese water dog? We would suggest the XLarge Puppy Apartment for a Portuguese Water Dog. OMG cute idea with the bead and the pee pad never thought of that but where do you get the little divider with the door? Thanks. Our patent pending ROOM DIVIDER is included with the Potty Training Puppy Apartment. It is the only type of dog crate in the world that has this ROOM DIVIDER. We invented this one-of-a-kind device and system. We also include for FREE an easy-to-understand Instructional DVD, which will show you the correct way to use this innovative device. Please visit our site for more information. Thanks for your inquiry. Can you ship this product to Puerto Rico? Yes, we can ship to Puerto Rico. Please visit our site's Shipping Policy for more details. Thanks for your inquiry. what size crate is this dog using? what size would be good for a pomeranian? The size of the Puppy Apartment in this video is a Small. Pomeranians usually weigh between 3-7lbs as an adult. We would suggest the Small PTPA for a Pomeranian. Thanks for your inquiry. i cant believe I just watched the whole 15 mins of this video, I don't even have a dog..
We are glad that you enjoyed the video. If you ever get a dog, please let us know. Thanks for the comment. THIS IS AMAZING!! GREAT PRODUCT. ! !